For all of humanity, weather is a very important thing. Knowing what the weather will be like has won and lost wars, made and lost fortunes, and caused many a person to show up at work soggy, late, or both. 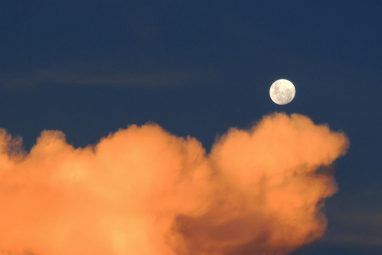 Since the dawn of media, the weather has been a staple that has sustained publishers of almanacs, sold newspapers when nothing was happening, tuned listeners into the radio, and viewers into the television news. Today, we carry all of this media in our back pocket in the form of our smartphones, yet something as primitive and primal as our need to know the weather is still of utmost importance. Today, I want to share with you two ways to get the weather, the 3D Weather widget and the AccuWeather.com widget, as seen on my Samsung Galaxy III. Let’s start with the 3D Weather widget as it is listed in our Best Android Apps List. What’s interesting about the 3D Weather widget is what can be found in the Settings area. Of course, you can choose from which town to draw weather information. Unfortunately, this app doesn’t support GPS locating or even cell tower locating. Narrowing down the town for which I would receive weather information was somewhat less accommodating that the AccuWeather.com widget as well. Neither the town I work in, nor the town I live in is available in the list. Port Hawkesbury is about 45km away from where I work, across the causeway on Cape Breton Island, so the local weather can be considerably different. Yet it would be close enough for those major events like a good snow or thunderstorm. If they’re getting it, we usually are, too. So I can sort of overlook this. Sort of. There are other settings to determine the information that you get. You can change the colour for the clock, however I found that mechanism to be awkward to use with a finger tip. By accessing the application through MyMobiler How to Remotely Control your Mobile Phone from Desktop How to Remotely Control your Mobile Phone from Desktop Read More , I was able to use this much better with the pointer of the mouse. I shouldn’t have to do that though. MyMobiler is also a little tricky to set up on the computer. Definitely not a plus in favour of the 3D Weather widget. The widget can also be used as a phone controller – and I think that’s where its strength lays. In the Settings area, you can set what happens if you touch on the hours, or the minutes. I’ve set touching the hours to bring up my e-mail and touching the minutes to bring up the calendar. You can set any application on your phone to respond to either of these actions. As you can see on the settings screen on the right, you can also show how much battery charge is left in percent, the moon phase, sunrise and sunset, how many minutes between updates, and a couple other options. The 3d Weather Widget brings the weather news adequately and visually, if perhaps in not as pretty a manner as the AccuWeather.com widget, but you still get the idea on the first glance. But, as advertised, if I click on the hours, I get my e-mail. If I click on the minutes, I get my calendar. If I click on the weather image, I get a web page with a multi-day forecast. This gives me more real estate on my main screen for other apps. What’s most important to me is that the widget does update in the time frame that I have specified. I chose 5 minutes, and in 5 minutes, the weather did update. When I set it to 60 minutes, the weather updated an hour later. This is the function that was not working in the AccuWeather.com widget that was preloaded on my Samsung Galaxy III phone. However, there is a newer version of AccuWeather.com widget and that feature did work when I updated the app. When I first got my Galaxy III, I thought it was great to have the AccuWeather.com widget on my home-screen so I’d always know what was happening with the weather. Living in a Maritime province, the weather can turn deadly rather quickly, or beyond beautiful in a moment. It’s a wonderful place to live. That original widget didn’t work very well, and there have been several iterations since. It’s getting better each time. The visual appeal of the widget is apparent, with a nice background image that gives us our first visual clue about the weather and large numbers to let us know the time and date. The temperature is handily displayed on the left half of the widget and a two-day forecast is shown on the right half. The top third of the widget shows my current location and the time as plainly as possible. Two things I want you to note are: 1) The widget says that the time is 8:17 p.m. If you can see the phone’s clock in the top right corner, it’s actually 8:44 p.m. Maybe not a big deal to you, but it has already made me late for an event. 2) The widget says it’s 17° C, but the notification bar of the phone shows that it’s 14° C. That info comes from this widget as well. Probably not a huge deal. When you tap on the widget, the full application opens up first showing you the weather Now. From there you can choose other screens that will show you Hourly, Daily, Maps, Videos, and News. Probably more information than one really needs, except in the event of a weather emergency. In the Settings of the widget, you can decide what units of measure you want to use, how often to update the weather, and for what location you should get regular Notifications and Severe Weather Alerts notifications. A feature I find amusing, but not really useful, is the My AccuWeather settings. You can choose a bunch of different weather parameters for different activities in which you might be involved: DIY Projects, Fishing & Game, Outdoor Fitness, Respiratory Health, and Travel. If the weather falls outside those parameters, the widget will tell you that it’s not a good day for that. The Respiratory Health selection is probably the only really useful selection – unless you live in a bunker without windows. 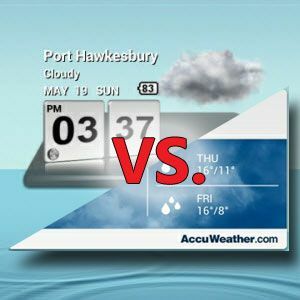 The final feature that the AccuWeather widget has over the 3D Weather widget, is that it has 3 different widget formats. The 4×2 format shown here, and two 4×1 formats shown in the image below. This is important to you if home screen real estate is at a premium. It always is. Both apps do the same basic job of informing me about the weather, however, 3D Weather widget adds a few other one-touch controls that free up space on my home screen for other priority apps. That’s its edge. AccuWeather.com has the edge in being GPS location-enabled so when I travel, I’m getting weather updates for the nearest listed town. On my drive to work, I go through about three distinct zones that can have vastly different weather. So the location feature is fairly handy. I also have access to a bunch of other information and can get Severe Weather Notifications direct to my phone, based on location. That’s its manifold edges! I’d say to choose between them is up in the air for you. 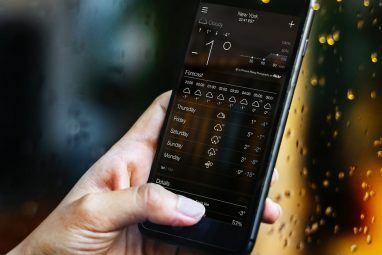 In doing this review, I’ve come to the conclusion that the 3D Weather Widget isn’t really a contender to be on our Best Android Apps list anymore compared to the AccuWeather.com widget, and I’ll be making that recommendation to our editors. What weather widget do you use? Why that particular one? WeatherBug WeatherBug - Even Better Than The Weather Channel [Android] WeatherBug - Even Better Than The Weather Channel [Android] Up until about a week ago, I only knew of two legitimate weather sources: The Weather Channel and AccuWeather. Both of these services have apps on Android that provide information on the weather. Imagine my... Read More ? Weather Underground Weather Underground - The Best Weather Site On The Web Weather Underground - The Best Weather Site On The Web Read More ? Does it serve your region of the world well? Some focus on the US and some focus on Europe, I’ve noticed. Would you sacrifice accuracy for screen real estate like I would? Drop a comment or two. I’m always up for a little chat! Whatever the app comes, i use Accuweather . It shows a great difference in Tamil Nadu, India. than other apps... Thanks to Accuweather Developers..
AccuWeather is great when it works, which isn't often. You can set when it should update, but the widget seems to look at the setting as a suggestion instead of an absolute rule. Sometimes, it will update twice a day and sometimes it will update once every two days ... and you never really know which cycle you're on. I think I'll be checking out the 3D Weather widget based on this review to see if that's an improvement. I really like these recommendations...excellent review. I used to use AccuWeather when I had my Galaxy S2 but now that I have the HTC ONE it hasn't worked so well on it. Every now and then when switching screens it will go completely blank. I actually use weatherbug now since one of the nice features of it is that it puts the current temp in the status bar at the top with the signal strength (on android). It also has pushed to me a few Air quality warnings and few other warning items. Looks really nice too. I might see how the 3D weather does on mine too. On my new Galaxy Note 2, I don't use any weather app at all. Removing the weather widget from my home screen was one of the first things I did. In my humble (but perhaps a bit radical) opinion, all weather apps are by definition completely redundant. Just ask yourself: do you really need one? How often do you really look at it? And if you do, does it tell you something you didn't already know? And their forecasts - are they actually reliable, exact and useful? I think not. In a much-changing climate those forecasts are often far beside the mark, and in a stable climate they tell you only what you already expected. If I need to know what kind of weather it is today, I just have to look out of my window. If I want to know and feel the weather in a more exact way than any app can tell me, I only need to take a step outside into the real world. And if I want to know tomorrow's weather, I just need to look out of my window tomorrow morning... If I want to know the weather in a place a thousand miles away, well I will easily find out on arrival! Or are you such an anxious, afraid, unsure person that you really cannot live without some (only seemingly reliable) weather forecast for tomorrow? I really think weather apps are a waste of screen space. Unless you're locked for the whole day in a windowless room, that is. And suppose that were true and you never experience the actual weather, then why should you want the weather anyway? No app can trump reality. This applies not just to weather apps, but to quite a lot of other escapist surrogate nonsense that people use as an excuse to keep looking at their phone instead of sampling a whiff of the actual world. I use weatherpro and haven't any problems. I have used accuWeather on holiday and found it to be really useful. There are a lot of features with the app as you have mentioned above, however, back home in the UK I find that the accuracy of this app leaves a lot to be desired. Similar to most weather apps it takes its readings from the nearest town or city. I live around 15 miles from the nearest town and the weather can be totally different which is no good to me. I run a holiday campsite and the weather is something that is very important for me for work as i work outside and there is nothing worse than a wet camper!! I now use the Met Office weather app which uses the nearest weather station to my location ( one mile away) and find this to be more accurate and has lots of features that makes it comparable to any other app out there. After trying dozens of weather application, I'm using accuweather and i must say it's good. I use WeatherPro. I've tried many of them. For me, it has most accurate weather prognosis. I used to use AccuWeather but, sometimes, it wouldnt work well in my area - Davis, Ca- so I switched to Weather+ about 4 months ago. I haven't had any problems so far. The app is simple, has all the features I'll ever use, and a nice widget for my galaxy 3s homescreen.